This album features music primarily related to the seasons of Advent and Christmas. It includes a number of recent commissions for the male vocal ensemble, Gentlemen Singers, and was recorded in their home town (Hradec Králové) in the Czech Republic. The programme also includes fresh arrangements produced for the recording. The carols are performed their original languages. Advent is the time of waiting for the Redeemer to come, the period when the liturgical year begins, a period that has inspired all artists for hundreds of years: poets, painters, musicians and composers, too. This four-week-long period of contemplation and charitableness has always been a symbol of purity and beauty and spiritual preparation for Christmas. 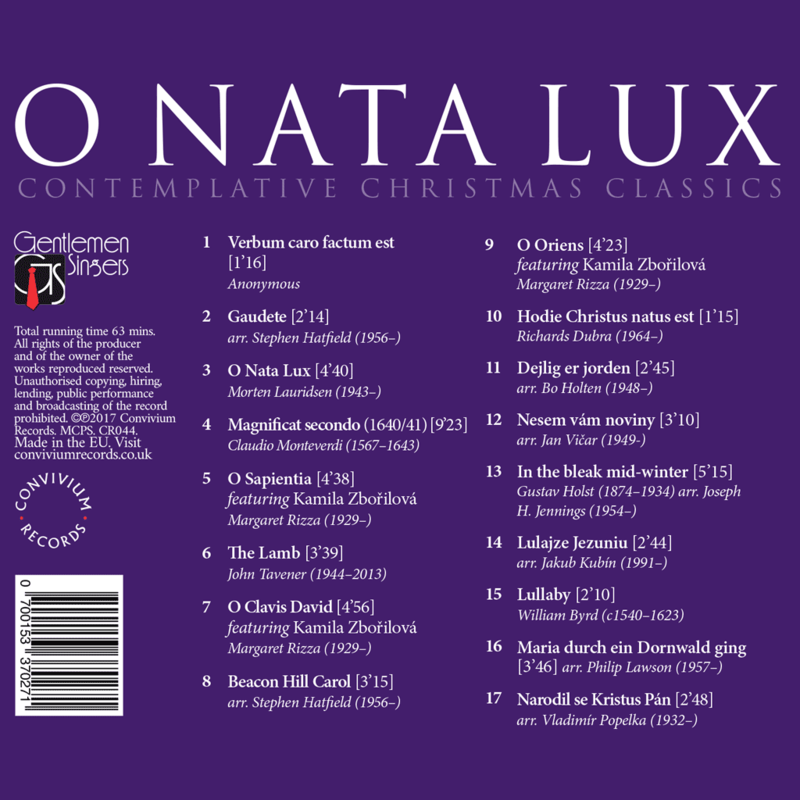 O Nata Lux, written by the famous American composer Morten Lauridsen, is the piece that the whole album was named after. It is a quiet and contemplative composition resembling heavenly light, and is one of the most popular pieces by this composer. 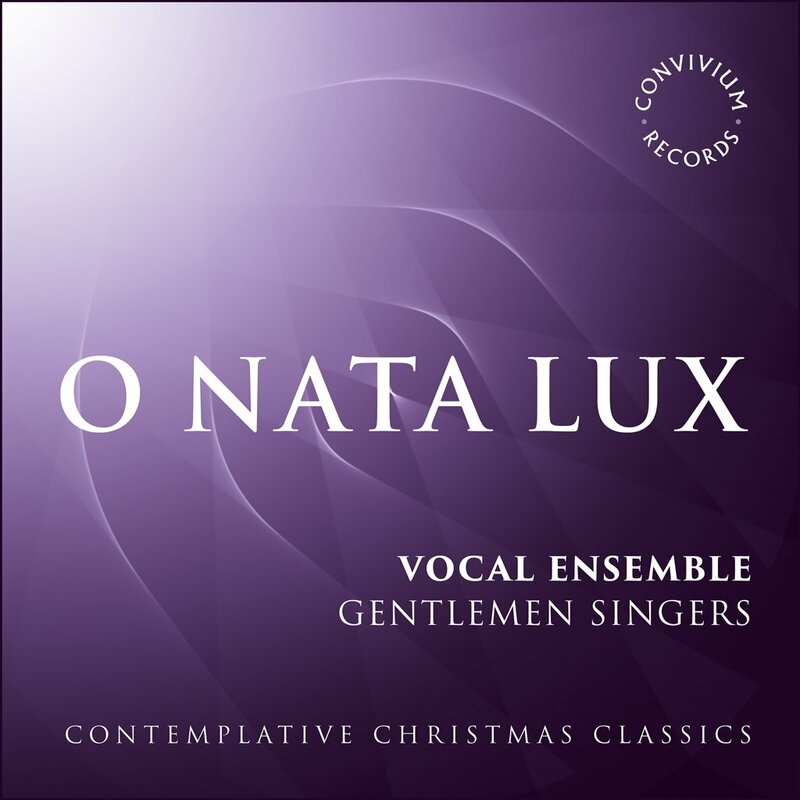 Some of the most beautiful Christmas songs were selected for this album, some of which are very intimate and have been arranged specifically for our vocal ensemble (Hatfield, Vičar, Kubín). Close your eyes now, relax and unwind together with us and listen to the beautiful tones inspired by the Christian tradition, and dedicated to one of the most important parts of our year. Vocal Ensemble Gentlemen Singers from Hradec Králové is the only professional male octet in the Czech Republic. e ensemble has won several international competitions and is a frequent guest of prestigious festivals from the USA to South Korea. The ensemble has given more than 600 concerts in twenty three countries on four continents and has released seven well-acclaimed CDs since its foundation in 2003. The members also organize the annual festival Sborové slavnosti • Czech Choir Festival • Hradec Králové. Its main goals are to promote a current choir scene and to spread Czech music outside the Czech Republic thanks to invited choirs from the whole world. An integral part of Gentlemen Singers’ work consists of further education thanks to organizing various workshops and masterclasses focused on both individuals and choirs. The members of the ensemble capitalise their own experiences which have been gained by co-operations with experienced ensembles, conductors, choirmasters, and composers. Vocal Ensemble Gentlemen Singers, whose activity is nancially supported by the City Council of Hradec Králové, Hradec Králové’s region and The Ministry of Culture, is a very proud ambassador of the Czech choir school. Vokální soubor Gentlemen Singers z Hradce Králové je jediným profesionálním mužským oktetem v České republice, vítězem mezinárod- ních soutěží a pravidelným účastníkem významných festi- valů od USA až po Jižní Koreu. Krom toho, že soubor od svého vzniku v roce 2003 absolvoval přes šest set koncertů ve třiadva- cetizemíchnačtyřechkontinen- techavydalsedmkritikouvelmi kladně ohodnocených nahrávek, každoročně v červnu pořádá festival Sborové slavnosti • Czech Choir Festival • Hradec Králové, jehož hlavním cílem je propagace české sborové hudby v České republice a prostřednictvím pozvaných špičkových sborů z celé Evropy i v zahraničí. Nedílnou náplň činnosti souboru tvoří taktéž edukace formou workshopů a masterclass určených jednotlivcům i celým sborům, při níž členové souboru zúročují vlastní zkušenosti získané díky spolupráci s předními světovými ansámbly, dirigenty, sbormistry a skladateli. Vokální soubor Gentlemen Singers, jehož činnost je pravidelně nančně podporována Statutárním městem Hradec Králové, Královéhradeckým krajem a Ministerstvem kultury České republiky, je hrdým velvyslancem české sborové školy.